The author is a management and engineering professional as well as an educationalist by qualification. He is best known for his impartial and analytical opinions on political, social and religious issues. He is also a passionate social thinker. The books "Pratibimb" and "Mahakte Panne" were published by Yuvraj Prakashan which consist of his prominent works. His first book '' Kathputli'', which was published in March 2017, made news for two months right from social media to print media. ''Kathputli was his first independent venture and was self-published. It was within a month that Kathputli was available worldwide on major platforms like Amazon, Createspace, smashwords, Bol and Ebay while it is available in India on Shop101, Iglobale, Bookdhara, Pothi and Flipkart in e-book and paperback versions. 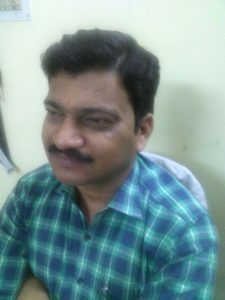 Prakash started working for newspapers as a freelancer in early 1990s. Starting from Hindi weekly ''Shrambheri'', he has continued to display his skills in the form of articles, poems and stories in various newspapers and magazines till date. Apart from Goodreads authors, he maybe followed at Amazon Author Central. At present, with 24 years of technical experience in steel industry, he is working at a senior management position in Bhushan Power & Steel LTD in India. Although a native of Moradabad (India), he stays currently in Kolkata. I get inspiration from real life situations. That's it. My thought process starts when I am all alone in a train journey to distant place or stay there in any hotel. I often sit at river bank and draft roughly. I started writing for news papers in the year 1990. I am now collecting and publishing. Thanks a lot to self publishing plateforms. I observe a condition to make a plot for my story, then I put myself in leading character and analyze various issues, write on a rough paper what happened in real life and what could be better in the same situation. It gives me a solid idea to draft the story. As I have published two short story books so far, I think a social story must contain a solid message to society for betterment of whole community, while a love story needs effective dialogue delivery. For aspiring authors I would like to suggest to connect with people on social media and It's easy to get words of mouth there. I searched on Google and come to know about self publishing options which are less expensive and transparent too. It's better option rather to rush behind traditional publishers. My suggestion for new authors is of self publishing and marketing through various online platforms like Kindle, kono etc. The future of self publishing is bright because it costs less to author and so to the readers too. I have tried many traditional publisher but feel cheated considering their packages.